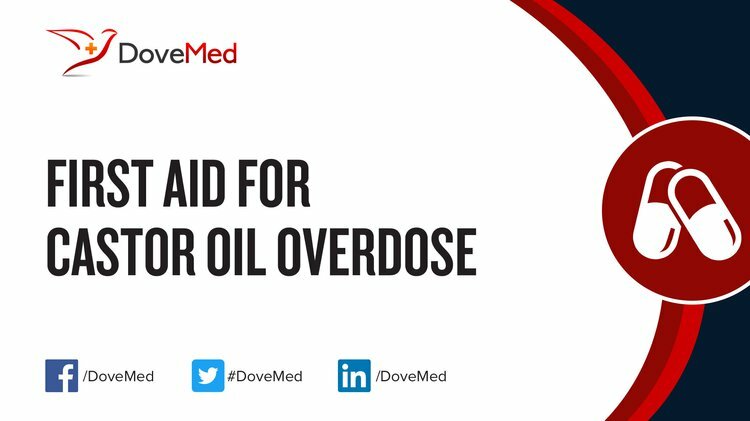 Castor Oil Overdose is the accidental or intentional intake of a product containing castor oil in dosage higher than prescribed/recommended values. What is Castor Oil Overdose? What are the Causes of Castor Oil Overdose? Note: The product can interact with other prescribed or non-prescribed medications in the body. Such interactions may enhance the therapeutic effects of the drug or other medications being taken, resulting in undesired side effects (such as an overdose). What are the Signs and Symptoms of Castor Oil Overdose? How is First Aid administered for Castor Oil Overdose? Who should administer First Aid for Castor Oil Overdose? First aid for Castor Oil Overdose is administered by healthcare professionals. What is the Prognosis of Castor Oil Overdose? How can Castor Oil Overdose be Prevented? Xie, S., Wang, F., Wang, Y., Zhu, L., Dong, Z., Wang, X., ... & Zhou, W. (2011). Acute toxicity study of tilmicosin-loaded hydrogenated castor oil-solid lipid nanoparticles. Particle and fibre toxicology, 8(1), 33. Langley, P. C., Patkar, A. D., Boswell, K. A., Benson, C. J., & Schein, J. R. (2010). Adverse event profile of tramadol in recent clinical studies of chronic osteoarthritis pain. Current medical research and opinion, 26(1), 239-251. Eid, G. N., Osman, H. S., Mohamed, H. Y., & Qotb, I. A. (2010). Castor oil intoxicated patients admitted to Ain Shams university poison control center (Egypt) during 2003-2007. Egyptian J Natural Toxins, 7(1), 2. Christiansen, A., Backensfeld, T., Denner, K., & Weitschies, W. (2011). Effects of non-ionic surfactants on cytochrome P450-mediated metabolism in vitro. European Journal of Pharmaceutics and Biopharmaceutics, 78(1), 166-172. Anik, S., Sharma, H., & Menon, S. (2017). Management and Palliative Care in Poisoning and Overdose. International Journal of Nursing Education, 9(2), 6-12. Afshari, R. (2016). The Chronicle of Arsenic Poisoning in the 19th Century. Asia Pacific Journal of Medical Toxicology, 5(2), 36-41. Silverman, B., Fu, F. N., & Guo, C. (2015). U.S. Patent Application No. 14/835,176. DAS, S., DOLAI, A., & CHAKRABORTTY, S. K. INSECTICIDAL/ACARICIDAL EFFICACY OF DIFFERENT FORMULATION OF PLANT OIL AGAINST COCONUT ERIOPHYID MITE, ACERIA GUERRERONIS. Commons, J. S. The Fixer, September 22, 1970. Silverman, B., Fu, F. N., & Guo, C. (2015). U.S. Patent No. 9,119,848. Washington, DC: U.S. Patent and Trademark Office.